In December of every year, I try to host a goal-setting party at my house with a few friends to help us get focused on the coming year. We laugh, we talk, we eat, we eat some more, we make vision boards and share our hopes and fears with one another. This year I decided to share some of the tools we will be using to keep our hearts centered on God, keep our minds focused on flushing out the vision He has placed within us, and our keep our bodies functioning as the temples they are. And I hope you will grab a few of these for yourself to make 2018 the year you decide to stop filling your moments with things simply to survive but to turn your spirit towards things that truly help you THRIVE! Yep...I'm shamelessly starting out with my own book. Why? Because I wrote this book with a purpose, and I wholeheartedly still believe the words on these pages with break chains and transform hearts. 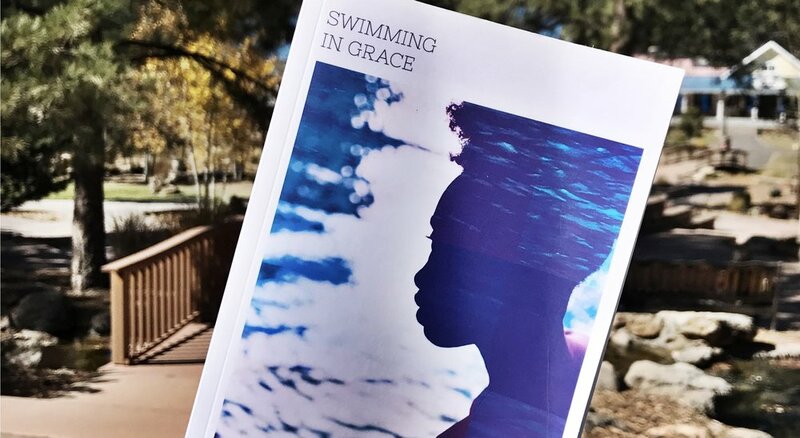 Even though Swimming In Grace chronicles my abortion experience in college, I want people to understand it's not a book about abortion. It's about about grace. It's about God's ability to renew us after we have made a series of decisions that could have broken us. If you've ever felt like you were drowning in the aftermath of one bad decision, no matter what it was, this book is for you. As a bonus, it also includes a 7-day devotional in the back to help you really dig into your own Truth and receive a new understanding of what God's grace looks like in your daily life. Seriously...get it NOW and just come back to read the rest of this when you're done. Tee-hee. Have you ever read a book that left you absolutely wrecked in the most beautiful way? This was definitely one of those books. I had the pleasure of meeting Torrie at a women's conference over 6 years ago when she stopped to ask me if I was "Always Ashley from Instagram". Ha! And even if God hadn't blessed us to grow into the sisters we are now I would still recommend this book to every woman I've ever known. The way she articulates her joys, sorrows, victories and struggles left my jaw dropping every few pages. I wish I could go into detail about the numerous times I had to just shut the book and call a friend to talk about it, but I don't want to give away to many details. I feel that reading something that's simply good for you soul that isn't considered to be a "self-help" book is very important. So, grab this book TODAY to reset your heart and help you focus on what really matters in life before you go into the new year. Taking the time to set effective, attainable, and BOLD goals has changed my life in so many ways. I have been using the Lara Casey PowerSheets since 2013, and they have helped me accomplish things in my personal and professional life by keeping me focused on #whatmattersmost in life. I am so blessed to partner with this company now to share Lara's love for seeing women truly thrive in every beautiful thing their heart yearns to cultivate. To order your set of PowerSheets, click here. In addition to the PowerSheets, I have become in love with the Write The Word Journals this year. Now, I'm one of those people who doesn't really need a reason to get a new journal. Its it's pretty and on sale consider it bought! However, I believe these journals are not only a treat for journal addicts for myself, but are perfect for someone who is looking to get into the habit of spending daily reflection time in God's word. They quality of the materials makes them extremely durable for people like me who like to carry my journal in my handbag all day just in case I get a few moments of unexpected quiet, and the interior layout takes away the intimidation away from those who aren't quite sure where to begin. Oh, and another key factor I don't want to leave out: they're so pretty! Yes, I'm a girly girl who usually only wears black and grey or any variation of the two; however, these colorful little pieces of heaven have wiggled their way into my heart and I love how they brighten up my workspace. CLICK HERE to get a better look at them and grab one (or be like me and get the entire set to use as gifts for your friends and family!). Once I finish flushing out my thoughts in my PowerSheets, I keep everything organized in my Simplified Planner by Emily Ley. This planner is EVERYTHING! It just speaks to my busy-mama heart, while reminding me that I am still so much more than a mom. I even tried another planner, which is very similar to this one, in 2015 and I still ended up coming back yo my beloved SP. The other planner gave me too much of what I already had with my PowerSheets, and not enough of what I needed on the daily planning pages. To explore all of the office fabulousness in Emily's shop and grab your own Simplified Planner, click here. I...love...this...planner! If you're an entrepreneur you need this. I don't have any long, fancy, flowery way to say it other than that. This worksheets in the beginning help me breakdown exactly how I wanted to represent myself as a brand, and allowed to finally recognize my target audience. Now some of it wasn't relevant to me as it dealt with people who work traditional job, but if that's you then you still NEED this planner! Because of this planner and my hour-long coaching sessions with Emmelie, I was able to successfully launch Swimming in Grace and have planned my upcoming book tour with ease. Click here to check it out! Greens - This is a gentle daily detox with with over 38 herbs and superfoods. The Cleanse - I do this at least once a month to counteract the many times I find myself living off gummy snacks and dry cereal because life just gets away from. WOW Wipes - They literally wipe wrinkles off my dang face. Do you need anymore details? Confianza - Praise Jesus for this! I have battled with anxiety problems since college, and suddenly becoming single mom of two toddlers while on unpaid maternity leave didn't help. Yes, prayer and yoga help a lot but the good Lord made the person who made this wonderful supplement and it has helped this mama out A LOT! Vegan Protein Shake - Cow's milk is not my friend so the lack of dairy is a plus. This mix is also non-GMO and tastes like cake batter. YUM! I love it after hot yoga or Zumba, and it's a great go-to for a quick breakfast. Many of these items are on a BOGO sale for Cyber Monday so click here to grab them NOW! If you already use any of these, please share your thoughts in the comments below! If you're a first timer and order something from this guide, let me know too because I'd love to stay in touch to see what you think about them!